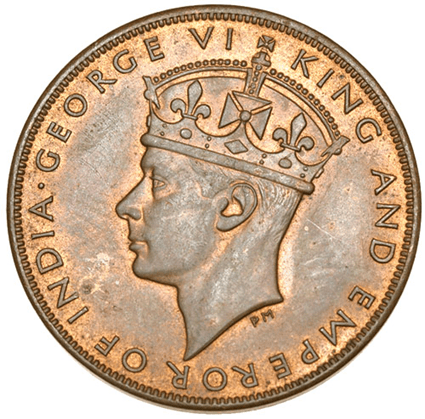 In the 1930s, all the coins for Hong Kong were minted in England and shipped to the colony. When war started in December 1941, five shipments of the 1 Cent coins were enroute to the colony. According to the records at the British Royal Mint, one shipment was unloaded in South Africa, returned to the Mint and melted down. The fate of the remaining four shipments is unknown and there are rumors that one shipment was sunk by a Japanese submarine and another shipment was captured by the Japanese in Hong Kong and melted down for the war. Although 5,000,000 were minted, the actual number that exists is unknown and it is one of the rarest Hong Kong coins. At the May 5, 2009 Baldwin’s Auction, one graded by PCGS as Proof 64RB had an estimate of between 15,000 and 20,000 British Pounds. Price realized was 8,000 Pounds. 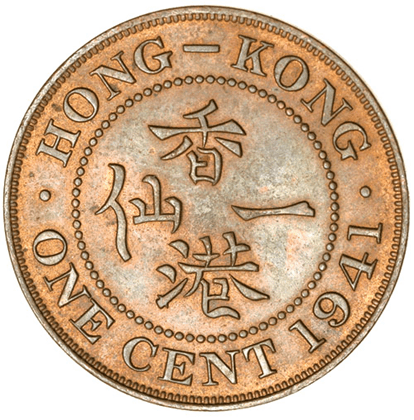 1 Cent coin, 1941, Hong Kong.